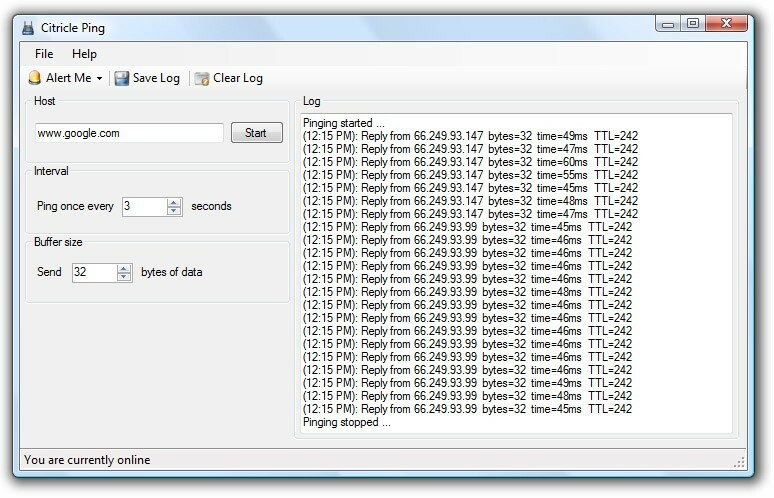 Citricle Ping is a freeware ping utility for Windows that can play an alert sound if the ping request is successful or it timed out. It was designed to alert the user when the connection to the Internet stopped or started up. When you were disconnected and you decided you want to go get some coffee until your Internet connection starts working again, normally you wouldn't be able to enjoy your coffee because you would have to go to your desk and refresh the browser to see if its working or not. With Citricle Ping you can just set it to alert you "on success" and enjoy your coffee until you hear the beep letting you know that your connection is up and running again.